I'm definitely getting more interested in Bryophytes. I grow lots of my plants in Sphagnum mosses and from there an interest develops in other mosses. I have tended over the past few years to annually photo-document the local terrestrial Orchid population and of course the other mosses in the terrain get a look at. Then as you're poking around the mosses you start to notice the Lichens and Liverworts which unlike the Orchids are on show all year round. More reason to get out there even if identification may cause the odd headache or two. 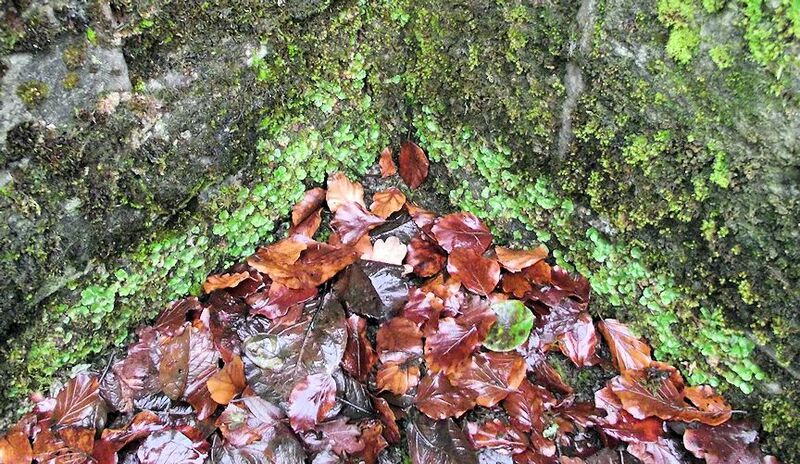 I've already contributes a few lichens on the forum so now I'll start with the Liverworts. 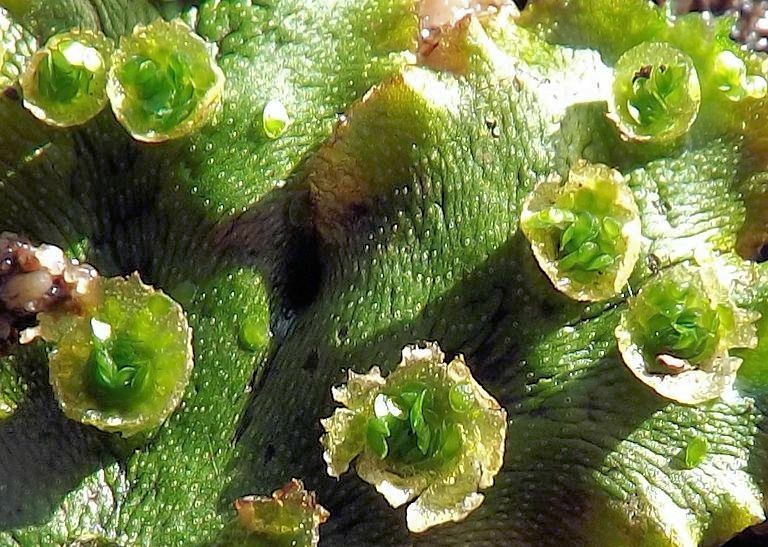 Here's a couple of photos of Marchantia polymorpa gemmae pots. I'm still trying to key out the above plants. 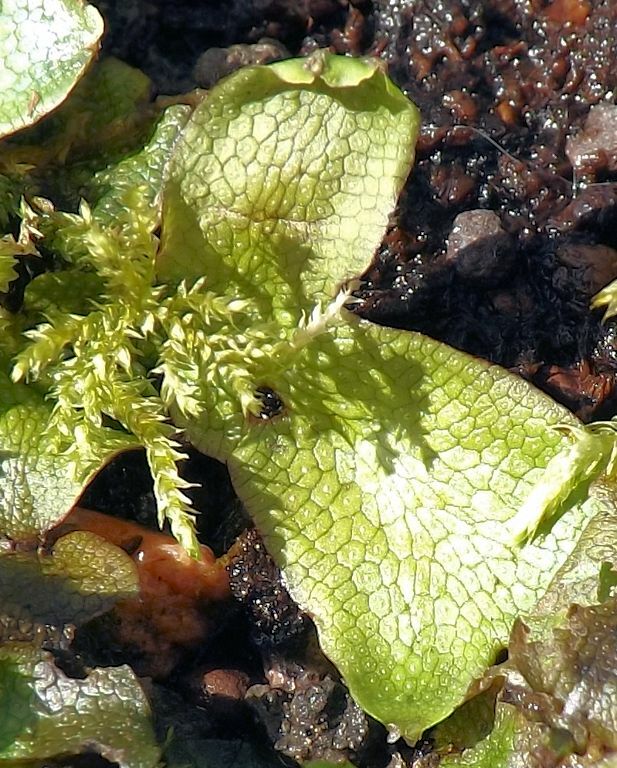 The one below does key out as Lunularia cruciata. Now this is Lunularia cruciata, I've keyed this one out. The crescent shaped gemmae pot is to the right and several loose gemmae are evident in the middle of the frame. 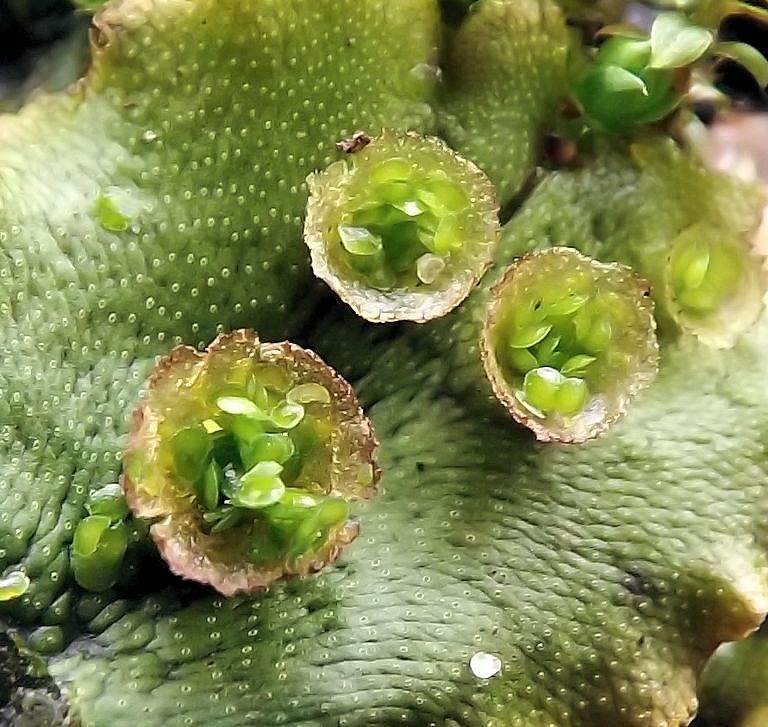 From the number of views my Liverwort posts on various fora have received, it would appear that quite a few people have a secret interest in these plants. With this in mind I'll add a couple I haven't posted here before. I returned to Pleasley Vale this morning ( 8th May) and continued a little way further down stream until the path veered away from the river. I found a further three thalloid species but unfortunately I was unable to photograph them in situ as my position in each case was a little precarious. I retained some small samples by reaching down around corners and will grow them on to aid and/or confirm ID. One I was happy to label up as Conocephalum salebrosum which I found in a dry ditch next to an old stone wall. The other two are as yet unidentified although I suspect one is a Pellia, probably P. epiphylla which will need to be confirmed. 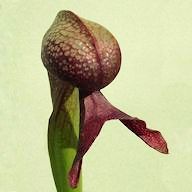 The Pellia can be a little difficult to get to species level. 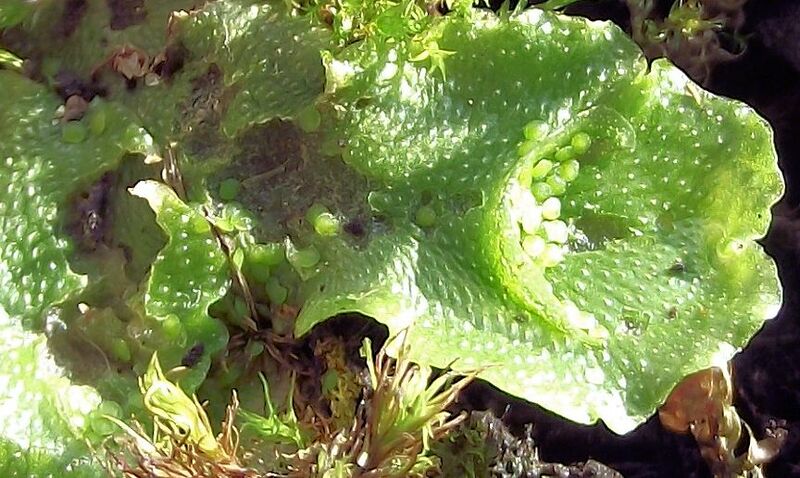 These add to Marchantia polymorpha, Conocephalum conicum and Lunularia cruciata from the visit in the video. 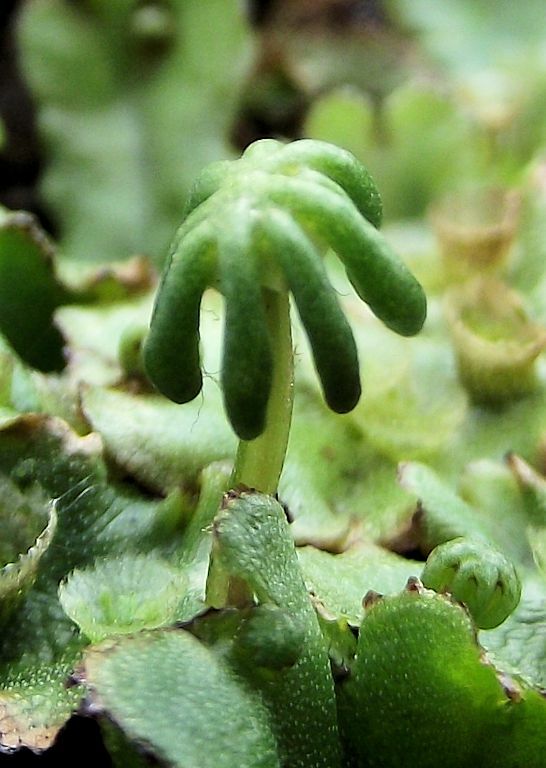 One of my Marchantia polymorpha is starting to flaunt its female bits. 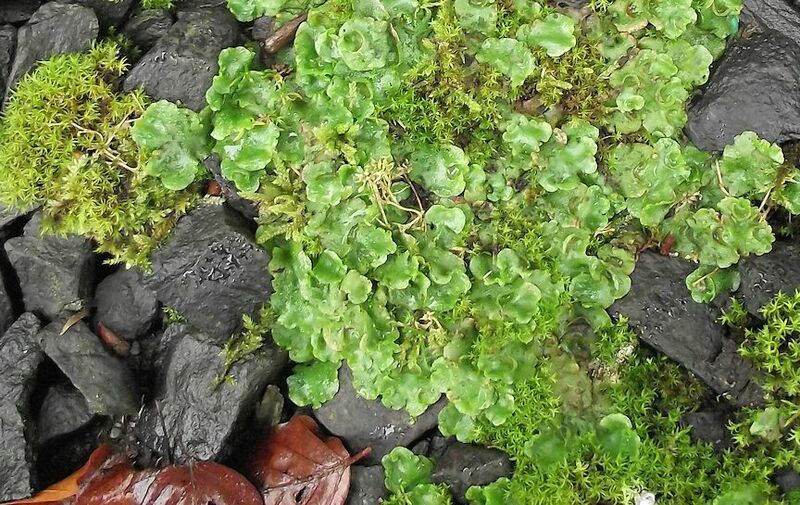 The three species of Liverwort that I've so far found in Wilton Lodge Park, Hawick, starting from the waterfall of the Cala Burn downstream. Lunularia cruciata inhabits the section nearest to the waterfall and then it's the turn of Conocephalum conicum. The latter covers a larger expanse on both sides of the burn, slowly petering out as the terrain opens out and overhead cover decreases. Marchantia polymorpha is the furthest downstream and is in the most open situation, occupying a flat area just to the side of the burn but not actually on its banks. Finally a bonus Lichen that shouted at me as I returned to the car.